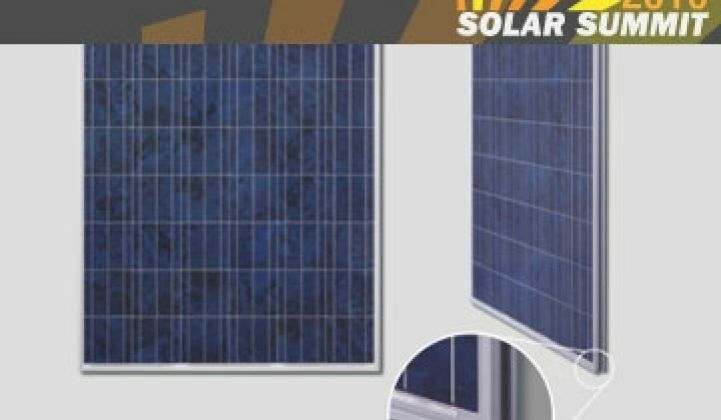 Canadian Solar has launched a new line of solar modules compatible with the racking system from Zep Solar that Zep says can slash costs and speed the installation process. Instead of mounting solar panels on the traditional metal frames used now, Zep props up the panels on a device it calls the Interlock Zep. In layman's terms, the Interlock is essentially a leg that clamps onto the frame of a solar panel and serves to prop up the solar panel and fasten it to the other panels in the array. Instead of a table, you just buy the leg. Overall, Zep says it can cut the time contractors spend on a roof by 75 percent. Although it's not as glamorous as cell design or efficiency, installation is rapidly gaining more attention in the solar industry as a way to bring down costs and/or percolate demand. Installation can account for one-third of the cost of a solar project and in some ways it can be more difficult to control than manufacturing. Installation doesn't take place in a factory, after all. The work ultimately has to be performed on location in varied conditions by people with a wide range of skills. In recent years, Solar City, Sungevity and Global Solar Center have devised software that trim project planning and estimating costs. Akeena Solar and GreenRay have promoted all-in-one solar panels complete with inverters that reduce the amount of sawing and work that has to occur at a job site while Armageddon Energy has created an Ikea-like kit for assembling solar arrays in minutes. Another start-up, Sollega, has started to tout a one-piece rack from recycled plastic. On the utility side, SunPods has developed modular racks for utility-scale solar parks that can be assembled mostly in factories. Expect to hear more about how solar companies aim to solve the plumber's crack problem as the year rolls on. Meanwhile, SunPower signed a deal to provide solar panels and trackers to seven solar power plants in the industry's new favorite country: Italy. The seven plants will be located in Sicily and will produce a combined total of 16.5 megawatts. Because of lucrative feed-in tariffs and the sunny weather, solar developers and panel makers are flocking to Italy. The country may see close to 1 gigawatt of solar panels planted on roofs and in the ground this year, said Shayle Kann, senior research analyst at GTM Research yesterday.